When you are looking for something to do, GO BOWLING! And when you want to go bowling, come to Hallmark Lanes! Killeen's newest, most modern and favorite place to bowl. Why? Established in 1987, Hallmark Lanes is locally owed and operated. We have 24 AMF SPL-II synthetic lanes with AMF pinsetters, and automatic scoring on large 42" LCD monitors. Our customer service area is bright, spacious and airy, with non-smoking areas in compliance with city ordinances. 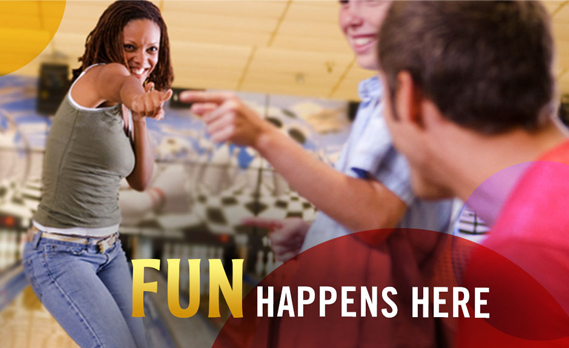 We also three 37" LCD TV sets on the concourse so you can watch your favorite sports programs while bowling. We pride ourselves in the cleanliness of all of our facilities, friendliness of our staff and the security of our closed circuit TV system. We also offer equipment for the physically challenged and plenty of family fun. We are proud hosts of the longest running Southwest Region PBA tournament. Wait until you sample the delicacies of Aunt Lucy’s Kitchen. It’s more than a bowling center snack bar and you’ve never met a cook like Aunt Lucy. We feature self-serve soft drinks in addition to breakfast, lunch and dinner specials, catering & take-out orders and a cafeteria for special parties. The 11th Frame Sports Lounge has a cozy, comfortable atmosphere with reasonable prices. We cater to Hails & Farewells and other parties and still have room for Pool, 6 TV sets with (3) DirecTV programming and (3) Spectrum, jukebox and a fireplace for cold winter nights. Our video game room features the most popular video and pinball machines. Come in, play some games, and have a blast! C&W Pro Shop is a locally leased and operated facility, located within Hallmark Lanes and provides a full range of equipment and supplies as well as a fully qualified, professional staff. Above all, we offer plenty of family fun. Our rates are the lowest of all commercial centers in the area, by the game or by the hour. We offer learn to bowl classes, individual or group instruction with the optional use of video. We have special rates for league and youth bowlers, the more mature, groups, Day Care Centers, schools and have equipment available for the physically challenged. We also offer special rates for company or group parties and schedule numerous fundraising activities. *All prices below include tax. * Extra frames: $1.08 per frame.